EMC2 is capable of controlling a wide range of machinery using many different hardware interfaces. 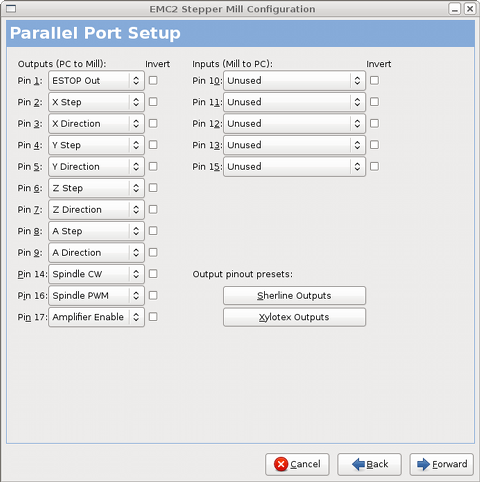 Stepconf is a program which generates EMC configuration files for a specific class of CNC machine: those connected to the PC using a standard parallel port and controlled with step & direction signals. 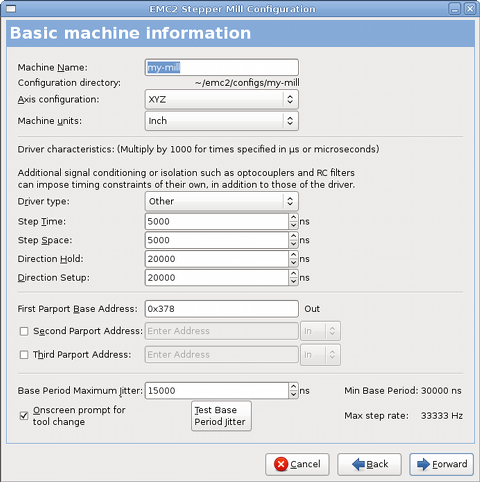 Stepconf is installed when you install EMC2 and is in the CNC menu. 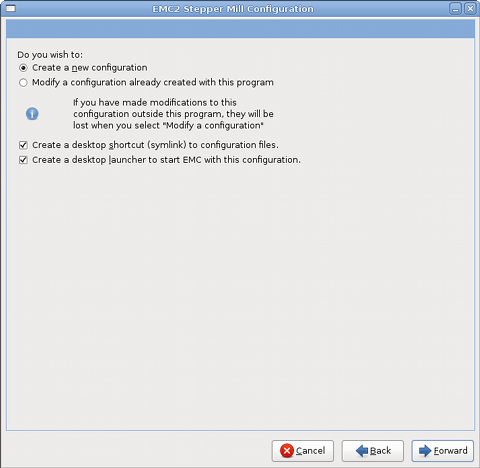 Stepconf places a file in the emc2/config directory to store the choices for each configuration you create. When you change something you need to pick the file that matches your configuration name. The file extension is .stepconf. The Stepconf Wizard needs at least 800 x 600 screen resolution to see the buttons on the bottom of the pages. Modify and existing configuration. After selecting this a file picker pops up so you can select the .stepconf file for modification. If you made any modifications to the main .hal or the .ini file these will be lost. Modifications to custom.hal and custom_postgui.hal will not be changed by the Stepconf Wizard. This will place a link on your desktop to the files. This will place a launcher on your desktop to start your application. Choose a name for your machine. Use only uppercase letters, lowercase letters, digits, "-" and "_". Choose XYZ (Mill), XYZA (4-axis mill) or XZ (Lathe). If you have one of the stepper drivers listed in the pull down box, choose it. Otherwise, find the 4 timing values in your driver's data sheet and enter them. If the data sheet gives a value in microseconds, multiply by 1000. For example, enter 4.5us as 4500. A list is on the Linuxcnc Wiki site of most popular drives with the timing values is in the Stepper Drive Timing Page. Additional signal conditioning or isolation such as optocouplers and RC filters on break out boards can impose timing constraints of their own, in addition to those of the driver. You may find it necessary to add some time to the drive requirements to allow for this. The EMC Configuration Selector has configs for Sherline all ready configured. How long the step pulse is "on" in nano seconds. Minimum time between step pulses in nano seconds. How long the direction pin is held after a change of direction in nano seconds. Usually the default of Ox378 is correct. If you need to specify addional parallel ports enter the address and the type. For information on finding the address of PCI parallel ports see the Port Address in the Integrators Manual. Enter the result of the Latency Test here. To run a latency test press the "Test Base Period Jitter" button. See the latency test section for more details. 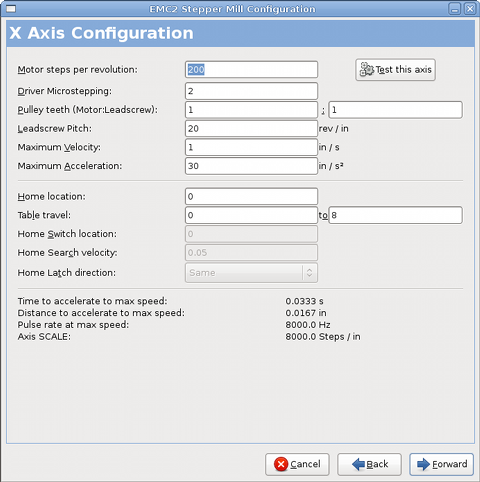 Stepconf automatically calculates the Max Step Rate based on the driver characteristics entered and the latency test result. Stepconf automatically determines the Min Base Period based on the driver characteristics entered and latency test result. While the test is running, you should "abuse" the computer. Move windows around on the screen. Surf the web. Copy some large files around on the disk. Play some music. Run an OpenGL program such as glxgears. The idea is to put the PC through its paces while the latency test checks to see what the worst case numbers are. Do not run EMC2 while the latency test is running. Run the test at least a few minutes. The longer you run the test the better it will be at catching events that might occour at less frequent intervals. This is a test for your computer only, so no hardware needs to be connected to run the test. Latency is how long it takes the PC to stop what it is doing and respond to an external request. In our case, the request is the periodic "heartbeat" that serves as a timing reference for the step pulses. The lower the latency, the faster you can run the heartbeat, and the faster and smoother the step pulses will be. Latency is far more important than CPU speed. The CPU isn't the only factor in determining latency. Motherboards, video cards, USB ports, SMI issues, and a number of other things can hurt the latency. The important numbers are the "max jitter". In the example above 7085 nanoseconds is the highest jitter. Record this number, and enter it in the Base Period Maximum Jitter box. If your Max Jitter number is less than about 15-20 microseconds (15000-20000 nanoseconds), the computer should give very nice results with software stepping. If the max latency is more like 30-50 microseconds, you can still get good results, but your maximum step rate might be a little disappointing, especially if you use microstepping or have very fine pitch leadscrews. If the numbers are 100uS or more (100,000 nanoseconds), then the PC is not a good candidate for software stepping. Numbers over 1 millisecond (1,000,000 nanoseconds) mean the PC is not a good candidate for EMC, regardless of whether you use software stepping or not. For each pin, choose the signal which matches your parallel port pin out. Turn on the "invert" check box if the signal is inverted (0V for true/active, 5V for false/inactive). Automatically set pins 2 through 9 according to the Sherline standard (Direction on pins 2, 4, 6, 8) or the Xylotex standard (Direction on pins 3, 5, 7, 9). If the input or output is not used set the option to "Unused". This can be selected from an input pin drop down box. A typical E Stop chain uses all normally closed contacts. These can be selected from an input pin drop down box for most configurations. If your driver board requires a charge pump signal simply select Charge Pump from the drop down list for the output pin you wish to connect to your charge pump input. The charge pump output is connected to the base thread by Stepconf. The charge pump output will be about 1/2 of the maximum step rate shown on the Basic Machine Configuration page. The number of full steps per motor revolution. If you know how many degrees the motor is (e.g., 1.2 degree), then divide 360 by the degrees to find the number of steps per motor revolution. The amount of microstepping performed by the driver. Enter "2" for half-stepping. If your machine has pulleys between the motor and leadscrew, enter the ratio here. If not, enter "1:1". Enter the pitch of the leadscrew here. If you chose "Inch" units, enter the number of threads per inch here (e.g., enter 8 for 8TPI). If you have a multi-lead screw then you need to know how many turns per inch it takes to move the "nut". If you chose "mm" units, enter the number of millimeters the "nut" would move per revolution here (e.g., enter 2 for 2mm/rev). If the machine travels in the wrong direction, enter a negative number here instead of a positive number or invert the direction pin for the axis. Enter the maximum velocity for the axis in units per second. The correct values for these items can only be determined through experimentation. See "Finding Velocity and Acceleration" below. The position the machine moves to after completing the homing procedure for this axis. For machines without home switches, this is the location the operator manually moves the machine to before pressing the Home button. If you combine the home and limit switches you must move off of the switch to the home position or you will get a joint limit error. The location at which the home switch trips or releases during the homing process. This item and the two below only appear when Home Switches were chosen in the Parallel Port Pinout. If you combine home and limit switches the home switch location can not be the same as the home position or you will get a joint limit error. The velocity to use when moving towards the switch. If the switch is near the end of travel, this velocity must be chosen so that the axis can decelerate to a stop before hitting the end of travel. If the switch is only closed for a short range of travel (instead of being closed from its trip point to one end of travel), this velocity must be chosen so that the axis can decelerate to a stop before the switch opens again, and homing must always be started from the same side of the switch. If the machine moves the wrong direction at the beginning of the homing procedure, negate the value of Home Search Velocity. Choose "Same" to have homing back off the switch, then approach it again at a very low speed. The second time the switch closes, the home position is set. Choose "Opposite" to have homing slowly back off the switch. When the switch opens, the home position is set. The number that will be used in the ini file [SCALE] setting. This is how many steps per user unit. 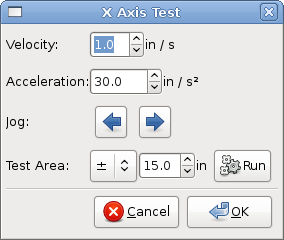 This will open a window to allow testing for each axis. This can be used after filling out all the information for this axis. With Stepconf it is easy to try different values for acceleration and velocity. Begin with a low Acceleration (e.g., 2 in/s^2 or 50mm/s^2) and the velocity you hope to attain. Using the buttons provided, jog the axis to near the center of travel. Take care because with a low acceleration value, it can take a surprising distance for the axis to decelerate to a stop. After gauging the amount of travel available, enter a safe distance in Test Area, keeping in mind that after a stall the motor may next start to move in an unexpected direction. Then click Run. The machine will begin to move back and forth along this axis. In this test, it is important that the combination of Acceleration and Test Area allow the machine to reach the selected Velocity and "cruise" for at least a short distance--the more distance, the better this test is. The formula d=.5*v*v/a gives the minimum distance required reach the specified velocity with the given acceleration. If it is convenient and safe to do so, push the table against the direction of motion to simulate cutting forces. If the machine stalls, reduce the speed and start the test again. If the machine did not obviously stall, click the "Run" button off. The axis now returns to the position where it started. If the position is incorrect, then the axis stalled or lost steps during the test. Reduce Velocity and start the test again. Physical problems with the motor, motor coupling, leadscrew, etc. Once you have found a speed at which the axis does not stall or lose steps during this testing procedure, reduce it by 10% and use that as the axis Maximum Velocity. With the Maximum Velocity you found in the previous step, enter the acceleration value to test. procedure as above, adjusting the Acceleration value up or down as necessary. In this test, it is important that the combination of Acceleration and Test Area allow the machine to reach the selected Velocity. Once you have found a value at which the axis does not stall or lose steps during this testing procedure, reduce it by 10% and use that as the axis Maximum Acceleration. This page only appear when "Spindle PWM" is chosen in the Parallel Port Pinout page for one of the outputs. The "carrier frequency" of the PWM signal to the spindle. Enter "0" for PDM mode, which is useful for generating an analog control voltage. Refer to the documentation for your spindle controller for the appropriate value. Is a pulse that occurs once per revolution of the spindle. This is a pulse that occurs in multiple equally-spaced locations as the spindle turns. 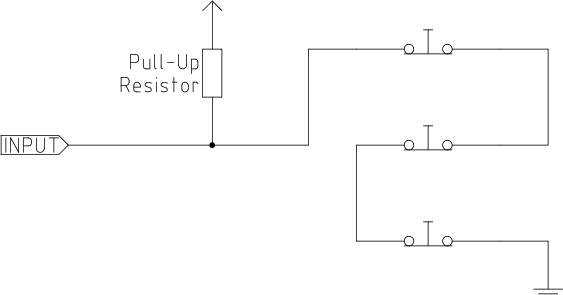 (optional) This is a second pulse that occurs, but with an offset from Spindle Phase A. The advantages to using both A and B are increased noise immunity and increased resolution. The number of cycles of the Spindle A signal during one revolution of the spindle. This option is only enabled when an input has be set to "Spindle Phase A"
Finish the remaining steps of the configuration process, then launch EMC with your configuration. Turn the machine on and select the MDI tab. Start the spindle turning by entering: M3 S100. Change the spindle speed by entering a different S-number: S800. Valid numbers range from 1 to 1000. For two different S-numbers, measure the actual spindle speed in RPM. Record the S-numbers and actual spindle speeds. Run Stepconf again. For "Speed" enter the measured speed, and for "PWM" enter the S-number divided by 1000. For instance, if your spindle will go from 0RPM to 8000RPM, but you generally use speeds from 400RPM to 4000RPM, then find the PWM values that give 1600RPM and 2800RPM. This will add the Halui user interface component. See the Integrators Manual for more information on Halui. This option adds the pyVCP panel base file or a sample file to work on. See the Integrators Manual for more information on pyVCP. This option will add the ClassicLadder PLC (Programmable Logic Controller). See the Integrators Manual for more information on ClassicLadder. Click “Apply” to write the configuration files. Later, you can re-run this program and tweak the settings you entered before. For each axis, there is a limited range of travel. The physical end of travel is called the hard stop. Before the hard stop there is a limit switch. 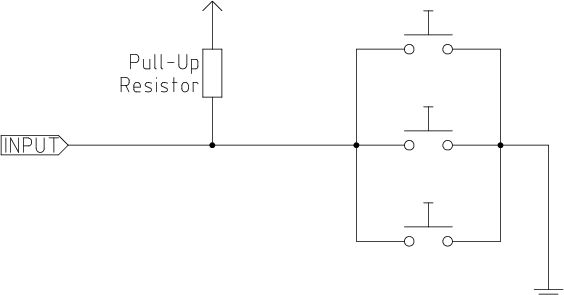 If the limit switch is encountered during normal operation, EMC shuts down the motor amplifier. The distance between the hard stop and limit switch must be long enough to allow an unpowered motor to coast to a stop. Before the limit switch there is a soft limit. This is a limit enforced in software after homing. If a MDI command, or g code program would pass the soft limit, it is not executed. If a jog would pass the soft limit, it is terminated at the soft limit. The home switch can be placed anywhere within the travel (between hard stops). As long as external hardware does not deactivate the motor amplifiers with the limit switch is reached, one of the limit switches can be used as a home switch. The zero position is the location on the axis that is 0 in the machine coordinate system. Usually the zero position will be within the soft limits. On lathes, constant surface speed mode requires that machine X=0 correspond to the center of spindle rotation when no tool offset is in effect. The home position is the location within travel that the axis will be moved to at the end of the homing sequence. This value must be within the soft limits. In particular, the home position should never be exactly equal to a soft limit. A machine can be operated without limit switches. In this case, only the soft limits stop the machine from reaching the hard stop. Soft limits only operate after the machine has been homed. A machine can be operated without home switches. If the machine has limit switches, but no home switches, it is best to use a limit switch as the home switch (e.g., choose Minimum Limit + Home X in the pinout). If the machine has no switches at all, or the limit switches cannot be used as home switches for another reason, then the machine must be homed "by eye" or by using match marks. Homing by eye is not as repeatable as homing to switches, but it still allows the soft limits to be useful. The ideal wiring for external switches would be one input per switch. However, the PC parallel port only offers a total of 5 inputs, while there are as many as 9 switches on a 3-axis machine. Instead, multiple switches are wired together in various ways so that a smaller number of inputs are required. The figures below show the general idea of wiring multiple switches to a single input pin. In each case, when one switch is actuated, the value seen on INPUT goes from logic HIGH to LOW. However, EMC expects a TRUE value when a switch is closed, so the corresponding "Invert" box must be checked on the pinout configuration page. The last two combinations are also appropriate when a "home to limit" is used.